Penland School of Crafts has been in existence for over 75 years. In 1965 glass was introduced. 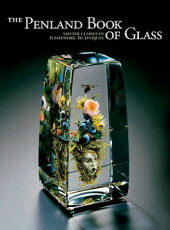 This book, The Penland Book of Glass – Master Classes in Flamework Techniques, profiles 10 exceptional artists whose specialty is lampwork also known as torchwork. With each artist profile they have provided a “hands on” section that takes you through a tutorial. Amazing. These are artists that are the best at what they do sharing their knowledge and expertise at the torch. I know I’m gushing about this book but it is warranted. As well as the profiles there are gallery sections that offer up an abundance of inspiration for anyone that works at a torch or have thought about trying it. I can’t recommend this book more. It’s truly a joy to look through.